Ramachandra Guha's book on Verrier Elwin, reviewed by S. Janah in the T.H.E.S. The following is a review, by Sunil Janah, of Ramachandra Guha's book "Savaging the Civilized; Verrier Elwin, His Tribals, and India". It appeared in THE TIMES HIGHER EDUCATION SUPPLEMENT, No. 1398 (1999 Aug 20), ed. by Andrew Robinson. The copyrights for the photograph of Verrier Elwin and of the Muria belong to the photographer, Sunil Janah. The second photograph did not appear in the original review, but has been added here for web-viewers. Please set your browser to full screen view. The F11 key toggles between full-screen and normal views in Windows Internet Explorer 5. Verrier Elwin: former Christian missionary who embraced India's tribals and became their most passionate advocate. Verrier Elwin, one of the most interesting Englishmen to have worked in India this century, came to his adopted country when he was only 25. A few years later, he moved to a tribal village in the heart of India. He lived most of the rest of his life among the tribals of India, whom he loved and worked for, and about whom he wrote beautifully, intensely and extensively. For many years before meeting Elwin, I had found the most exhilarating breaks from my dreary, urban, middle-class life in India among our tribal people in the forests. I had gone to photograph them and live with them whenever I could afford the long and arduous trips. I had read all of Elwin's books published at that time, and admired him greatly; but I met him for the first time when I and Victor Sassoon - who later became one of his closest friends and associates - were making picture stories about India for magazines in the West. We were then trying to do one on a Hindu family's pilgrimage to Benares (Varanasi). Elwin happened to be staying in Benares at the time, and Victor decided to ask him to write for us. He had just been appointed deputy director of the Anthropological Survey of India,which was then still a branch of the Zoological Survey of India - "man prostrate at the feet of animals", as Elwin put it. His friend, W.G. Archer, who was in the Indian Civil Service before becoming a curator at the Victoria and Albert Museum, had asked about Elwin: "What makes a man change his nationality, abjure civilization, and, in the upshot, become a blend of Schweitzer in Africa and Gauguin in Tahiti?" That question cannot be answered, but it prompts curiosity about his life. Elwin was born the son of an Anglican bishop. He graduated from Merton College, Oxford, with a first in English literature and won a scholarship to support his degree, which the family tradition directed to be in theology. A doctorate in divinity had prepared him to be ordained as a priest, but his associations and interests had turned Elwin, while at Oxford, into a mild Indophile, with his heart turned wistfully towards Tagore and Gandhi. At a Students' Christian Movement meeting, which Elwin had attended at Stanwick, he met J.C. Winslow, who had come back from India to recruit young men for his Christian mission. Winslow, a product of Eton and Balliol, had gone to India to spread the gospel, and was so awed by the astonishing richness of Hindu spiritual and cultural heritage and ideas that he thought that Jesus could "take all those elements that were of permanent value and bring them to a richer completion". Elwin was already looking eastwards and was easily seduced into joining Winslow's Christa Seva Sangha, which drew its inspiration from the traditional ashram ideal of the Hindus, as reinterpreted and actualised by Gandhi's ashram at Sabarmati, a centre of abstinent and religious life, dedicated to the service of the poor. After a view years of living in the tradition of service to the church and in compliance with the Gandhian ascetic ideals, Elwin felt impelled to break all links with his past. He decided to work among the lively, sensuous, forest-dwelling tribals - materially the poorest of the poor in India, but blessed with a capacity to endure much and enjoy life fully. They were rich in their capacity to love, in their sensitivity to beauty, in their delightful songs and dances, and in their ability to make fine, strong and beautiful things. Muria tribal boys and girls, in a courtyard inside their ghotul (youth dormitory). Bastar, Madhya Pradesh, Central India. Elwin had not planned on anything other than being of service to these people when he and his lifelong volunteer colleague, Shamrao Hivale, moved to a Gond tribal village in Central India to have their own ashram. The events that followed - shifting their base deeper into the forests, establishing a home for lepers there, doing research work among the tribals as a friend and helper, practicing a "philanthropology" that brought with it a need to defend the tribals against all external aggressions, cultural or economic,and writing volumes about them - appear, with the benefit of hindsight, to be Elwin's unfolding destiny, as were his becoming an Indian citizen, receiving one of the country's highest honours, and becoming a friend and advisor to Jawaharlal Nehru. Elwin had begun his work in India as a very unusual Christian missionary with Gandhian leanings, unacceptable both to the British Raj and to his own church in India. He soon became disenchanted with the pretentious aspects of Indian spirituality and with Gandhian puritanism and self-righteousness. India's "primitive" tribals won his heart, eventually; and he gave his brilliant mind and devoted his enormous energies, towards helping them, writing about them and defending their rights and their waysof life. His beginnings were those of an earnest, somewhat uncertain and self-doubting but deeply religious man, and, although he later rejected all formal religions, he never could choose any other than a selfless, dedicated way of life. But the roles he took on were always nonconformist. Consequently, he had to fight powerful opposition and persecution from organized, conventional people all his life. Although Elwin was able, in his lifetime, to have some influence on India's policies towards its tribal peoples, one fears that, with time, much of what he lived and stood for is in danger of being ignored, misunderstood or forgotten. 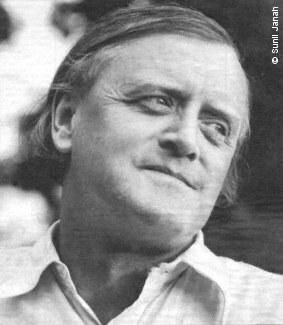 I was intrigued, therefore, when I learned that a young scholar, Ramachandra Guha, had turned his attention to Elwin's life and work. Guha has written books on the ecology, history and sociology of India and is the editor of several books on global environmentalism. Guha's Savaging the Civilized: Verrier Elwin, His Tribals and India is a well-researched and well-written biography of this remarkable Englishman. Elwin's own books and correspondence, and the writings of others about him, are Guha's chief source materials. He has also put in a great deal of time and serious effort, travelling to Elwin's school and university and youthful haunts in England and to all the places with which Elwin was associated in India. He has collected a great deal of information from archival records and documents, and from people he interviewed, and has used this material skilfully, in his very readable and interesting narrative, to give Elwin's life its full dimensions. In addition, he has incorporated relevant historical information about India and her tribes. Elwin wrote a gentle, humane and memorable autobiography, The Tribal World of Verrier Elwin, published shortly after his death in 1964 by Oxford University Press. Guha answers, at some length, the question of why Elwin left so much out of his memoir. As he said in his preface: "My path has sometimes been shadowed by clouds and I have hinted at them... but I have not enlarged on them." This may have been his response to the complaint of his publisher, R.E. Hawkins, who had written to him: "You have omitted nearly all the shadows." Guha has resolutely and unflinchingly gone into all the shadows that Elwin chose to keep out of his own book. These revelations do not diminish Elwin's stature: they add to it. All the shifts and changes in his life - from Oxford don to missionary in India, to Gandhian fighting the British rulers of the country, to going tribal, rejecting Gandhi and all religious taboos, marrying a tribal girl, having a bruising divorce from her and then marrying another tribal, and finally renouncing his nationality to become an Indian citizen - all these transformations did not take place without Elwin undergoing anguish and inner turmoil. Each dissension had caused estrangements, enmities and loneliness, which, together with all the prejudices and calumnies directed against him from all quarters, must have taken immense strength to endure. Elwin rarely talked about his intimate feelings. I remember an evening when he was not well and I was visiting him in his Calcutta flat. He told me that, despite the weariness we cannot escape in the culture that we live in, we can have our moments of exultation and moments of great peace. As long as we know that we shall experience these again and again unexpectedly, the darker tunnels of misery and despair we may go through do not diminish our faith that life, even for a tormented person, can be wonderful and joyous. Elwin's deepest longings were for this sustaining mystic's joy. His experiences of this joy informed and transformed his life and work. The final chapter of his autobiography, "The elusive treasure", is interspersed with thoughts about what he believed in and cherished all his life: freedom, compassion, love, including sexual love, and beauty. His battles were with those who dismiss and stifle them. Guha may rightly feel that his detailed narrative of the events of Elwin's life shows this aspect of him adequately, though I had expected it to be brought into the foreground more strongly. However, it is perhaps unfair to expect an objective, highly researched biography to spotlight what appeared to me to be the essence of the living man; perhaps I was just particularly in sympathy with that aspect of him. For indeed Elwin was a man of many aspects and talents, with a very practical and rational side that helped him carefully to further the tribals' cause and long-term interests, and an ability to bridge cultural divides that was both unusual and essential. Savaging the Civilized is a major achievement. Guha has understood Elwin well - his triumphs, truancies and tribulations - and shows genuine respect for this Englishman whom he never met. This scholarly yet lively book will, one hopes, revive interest in Elwin's life and vision and serve as an inspiration and resource for scholars, policy makers and all thinking people concerned with tribal and developmental issues, as well as with more general social and spiritual questions. 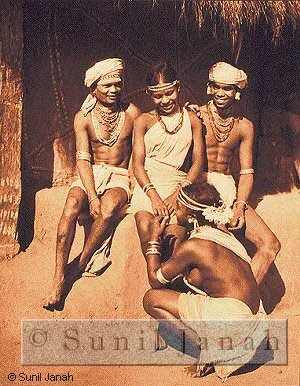 Sunil Janah is a photographer, writer and author of the Tribals of India. This page, and others at this website, are best viewed with your web-browser set to full screen view.